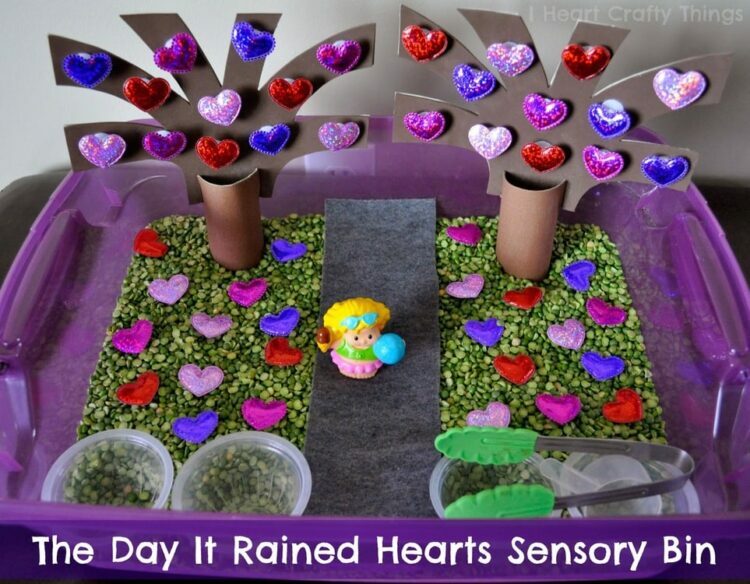 I put together this Sensory Bin for my daughter to go along with our favorite Valentine’s Day book, “The Day It Rained Hearts” by Felicia Bond. 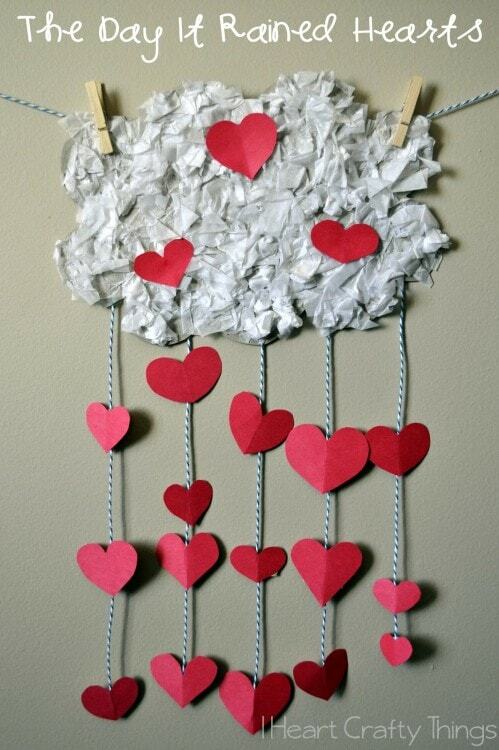 I wanted the hearts to lay on the ground as if they had rained just like in the story but also wanted them displayed on trees like in the end of the story. 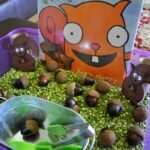 I am happy with how the sensory bin turned out. 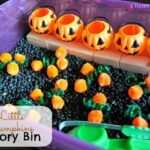 I placed a felt gray path in the middle of the bin and put one of my daughter’s play people on the path to create an invitation to play inside the sensory bin. 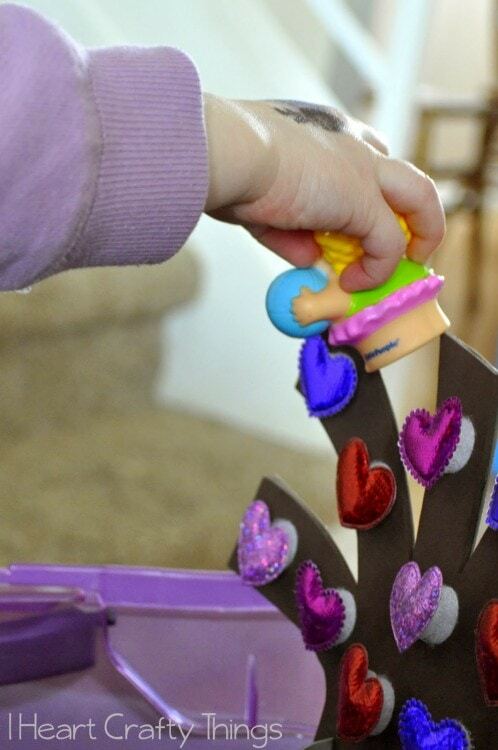 I also placed four small containers (empty fruit containers) in the bin and challenged her to sort the hearts by color in the bins when she first started playing. After that I just set her loose to play and discover. 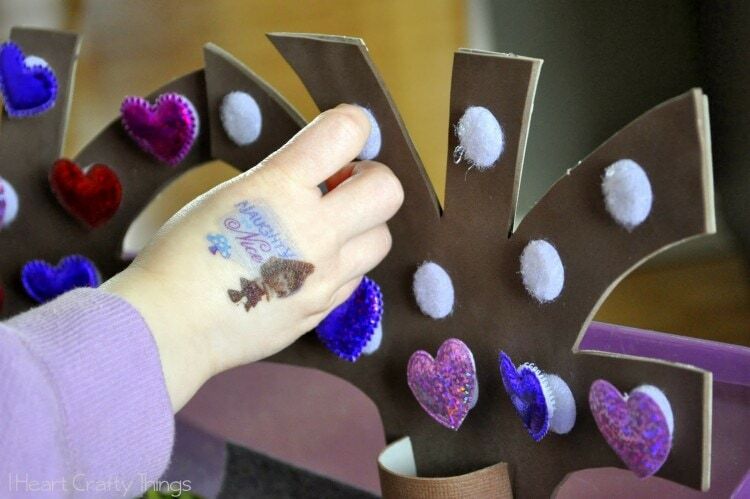 The hearts on the trees are attached with Velcro so she can remove and replace them as she wanted to. 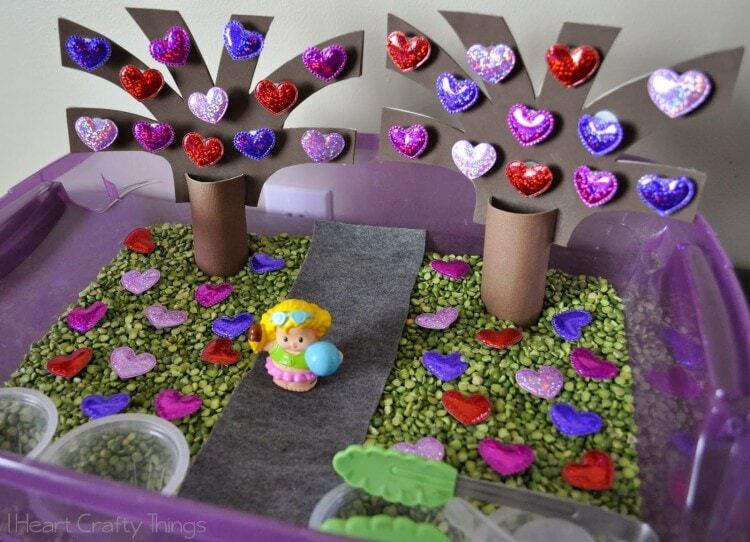 This is similar to our Apple Orchard Sensory Bin. To make the trees, I wrapped a toilet paper roll in brown construction paper and glued it shut. I cut slits on the sides of the toilet paper roll to push the top of the tree down in it. For the top branches of the tree, I cut the branches shape out of a brown foam sheet. Then I traced that onto a cereal box, cut it out and hot glued the foam sheet onto the cardboard cereal box to make it more sturdy. Then I pushed it down into the toilet paper tube. 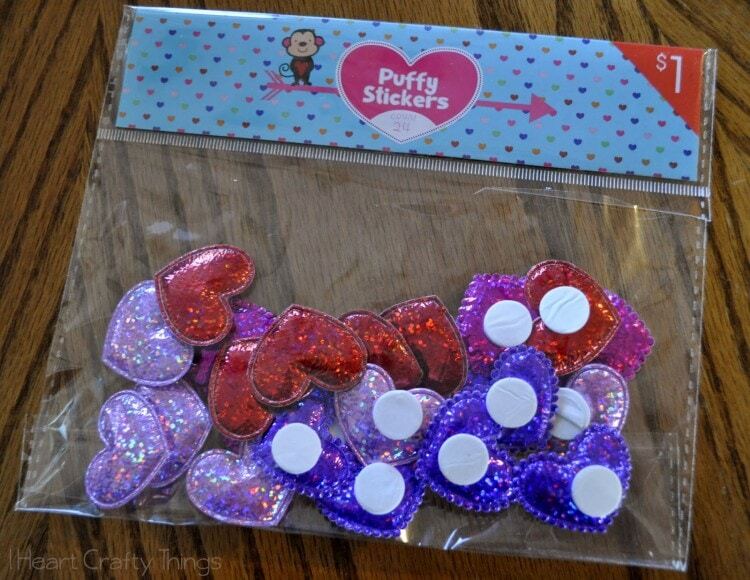 Before I forget to mention, the hearts I used were Puffy Stickers found in the Target $1 section. I bought 2 packages for the bin. 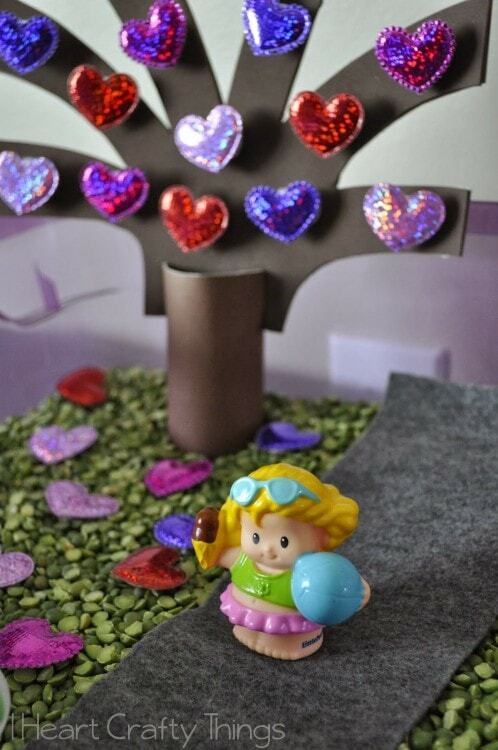 I took the backing off the stickers before putting the Velcro adhesive on the ones used for the tree. 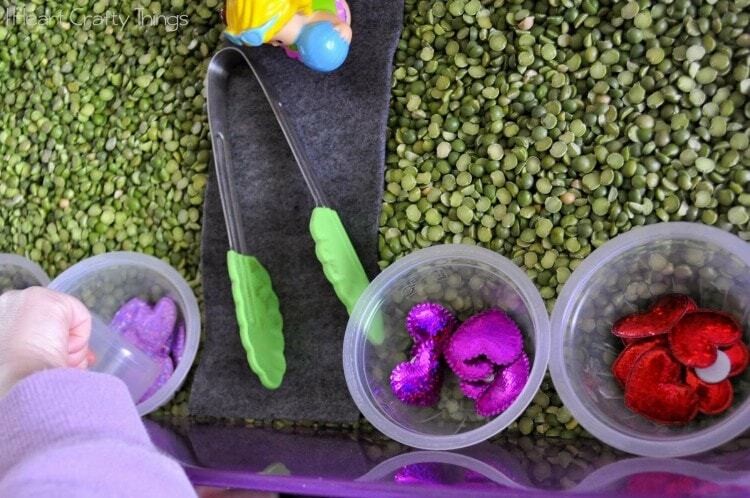 I also placed our small tongs and a small scoop in the bin which she always loves playing with. 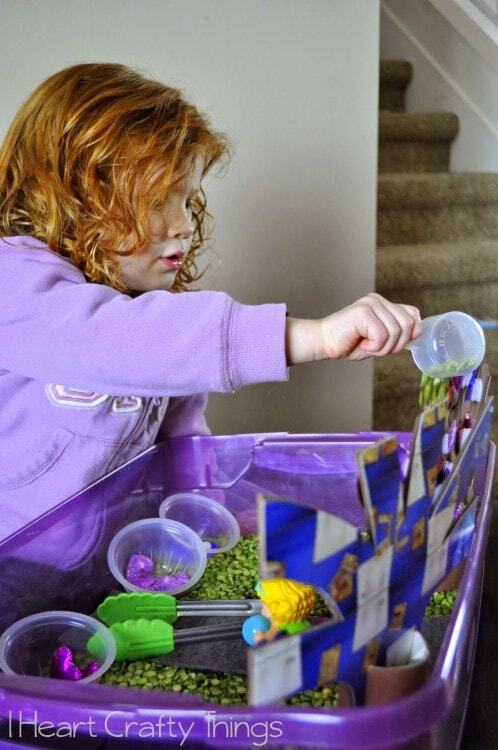 I am having so much fun putting these bins together for my daughter. 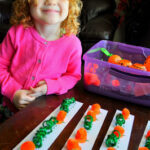 She looks forward to playing with them every day and it gives me a great opportunity to get some chores done while she plays. 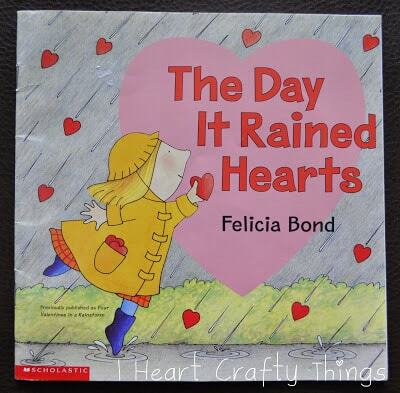 You might also enjoy our The Day it Rained Hearts Craft!